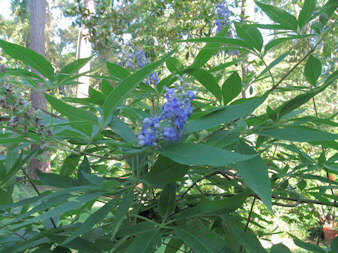 Ever since my mother planted a Vitex tree many years ago, I have wanted one of these trees. They have such pretty flowers and they come at a time when many of our showy plants have stopped blooming. I never could find one at our local nurseries, and finally, my mother had two sprouts show up that she cared for until they were a good size. These two ended up in my garden about seven years ago. One is the front yard and the other is in the back yard. They are growing bigger now that some trees came down, and there is more sun for them. This tree grows to about 15 feet, is deciduous, and is hardy to zone 6 (though it may die back in winter and remain shrub size that far north). 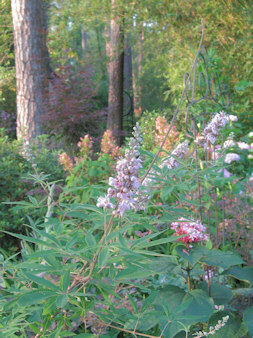 Around here it starts blooming at the end of May, and if the flowers are trimmed back, it will send out new blooms. Hummingbirds and bees love this plant. Once established, this tree needs very little water. It is often planted alongside highways because of its drought tolerance. This is the pink Vitex tree I planted in the spring of 2007. It is not very big yet, but with more sun, I am sure it will soon as big as the blue one. I read about the pink form in a gardening book, and surprisingly, had little trouble locating one at a nursery near here. Maybe these trees are becoming more popular around here and are now available. If I am outside working in the garden, walkers always stop and ask what the name of this tree is. Maybe if more people become interested in buying out of the ordinary plants, more will be made available for all of us. The shell ginger has started to bloom. I think this is a little early, but I’ll have to check my garden journal to make sure. 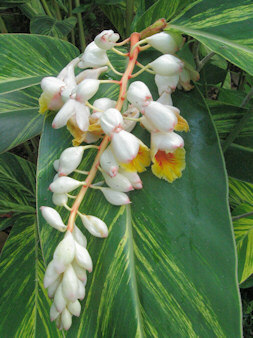 I have the green and the variegated forms of shell ginger, and it is the variegated that has started to bloom. I am a little surprised it is blooming already, since this is the first year it was knocked back by freezes. I received this ginger from my generous sister. This cluster of flowers is so pretty. It reminds me of baroque pearls. 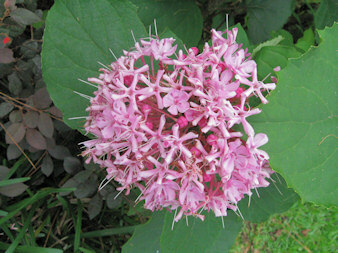 Soon after the cluster fully develops, the individual blooms open. 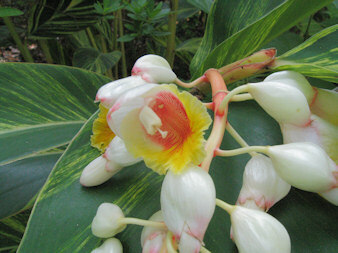 The demure string of white and pink-tinged buds open up to bright yellow and orange-red flowers. I like the texture of the foliage and the tropical feel this ginger brings to the garden. The Easter lilies are in their glory now. In a few more days, I am afraid the heat will get to them. They have done extremely well, blooming for over two weeks, and this is only their second year. They must love where they are because they have multiplied and grown bigger than expected. I bought them last year from Brent and Becky’s Bulbs. They did well last year, but this year has been unbelievable. I will have to divide them in the fall. I couldn’t be more pleased with these bulbs. I can’t wait until next year when all the smaller bulbs will have grown and will display so many flowers. The fragrance, esp. in the early morning is heavenly. Well, my plans for the summer are working out. Today, I planted seven daylilies that had been growing in containers, transplanted a hydrangea, replanted rain lilies, cut back some of the bamboo that was shading the azaleas, cut out an orange lantana to make more room for better plants, and dug some more lirope out of the garden beds. Tomorrow will be another day to try and catch up with all the gardening chores that still need to be done. The fruit trees that were planted last year are doing very well. I expected that the pear tree might bear a few fruit this year as the Bartlett pear tree that was planted several years ago is doing extremely well. 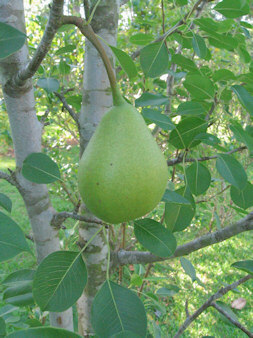 The new one does not have that many pears, but for a new tree, it is surpassing expectations. I am surprised that the birds are leaving it alone. Maybe having all those feeders and bird baths are keeping them too busy to check out the fruit trees. 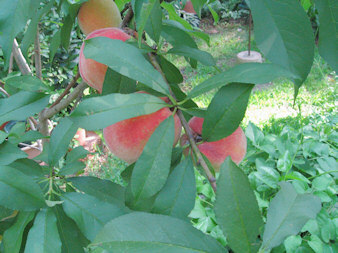 The two new peach trees are also doing very well. I tried to talk hubby into taking some of them off when they were tiny and just starting because the tree may not support all of them, but he would not do it. So, we will have to see if they all stay on until they are ripe. They certainly look good. The citrus trees are doing well, as usual. We have been growing Satsumas for about ten years now. They, too, have a lot of fruit that we will be able to harvest. Our new little lime tree, however, only kept two limes this year. I know that this is not unusual for new citrus trees not to hold on to their fruit, so I guess the mojitoes will have to wait for another year. Hubby also planted three fig trees last year, but the figs are still tiny and few. So our “orchard” progresses. We are hoping in a few years to have a bumper crop from every tree, but only time will tell if we get our wish. 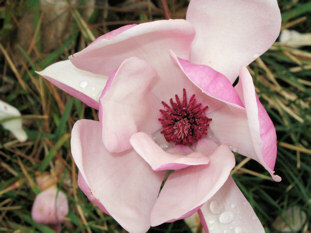 What’s going on with Japanese Magnolias? Back in February, I posted about the ones blooming here, and now, everyday there is an unbelievable number of hits on that post. In fact, it is the most popular post I have written. Are they just starting to bloom in the far North? Is that the reason so many people are searching the net for anything written about these blooming trees. Here are some of the searches that have shown up in my blog stats. One of the most popular searches showing up is when to prune them. Prune after flowering. Do they bloom all summer? No, a big flush of blooms, and then once the leaves pop out, no more flowers. Well, that is not entirely true. 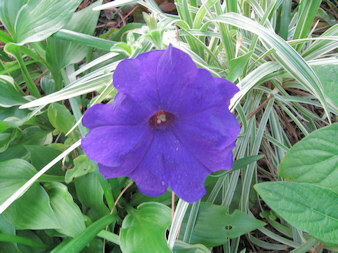 Occasionally, a few flowers have shown up in the fall. I think that may happen when the tree is under stress though. 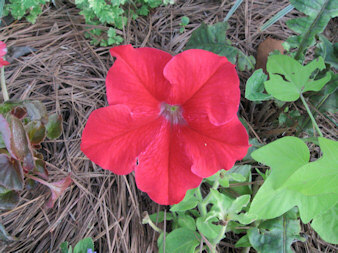 After Katrina hit and we had no rain for many weeks, my neighbors tree put out many flowers. That was very unusual though. No, they are not evergreen. They are not bushes but are small trees. They will grow to about twenty-five to thirty feet tall. It does not grow very fast. They are considered medium to slow growers. They grow in zones 4 to 9. From all the hits I have had on the subject of Japanese Magnolias, this must be one popular tree. Today is the first day of my summer vacation. I’m off for the next two months. I am hoping to finally finish getting the garden in shape. I have big plans; let’s just hope the body can withstand the heat now that the onset of hot weather is here. I had to water the entire garden this morning since we have not had any rain in almost a week. I was out very early and was happy to see three new daylilies blooming. The first one is Little Missy that I planted last year. The next two are ones from Oakes Daylilies that my sister sent me in March. I am so pleased with their daylilies. I don’t know which one I like best. These are the first flowers for these three, but there are many buds so they should be blooming for some time. Just about three more of the Oakes ones left to bloom. It is kind of fun waiting to find out what they will look like. The first bloom on the Night Blooming Cereus was discovered this morning and there are at least two that should open tonight. I got this plant from a neighbor a few years ago. It seems to be blooming a little earlier this year. I have a different one from my mom, and it does not look like it is ready to bloom any time soon. Today, I worked on getting rid of the green spider plants that have taken over by the back door. I cut them back last year, but now they have to be ripped out. They can really take over and be hard to take out. Most have to be dug out, not just pulled out. I don’t even remember how they got started there. Probably I thought they would make a good ground cover, so I just let them go. Boy, was that a mistake. Tomorrow, I am going to try and transplant a few thing so that I can finally plant the Blushing Knockout roses in the garden. I am trying to make realistic goals for each day instead of grand plans that can be discouraging if not carried out. 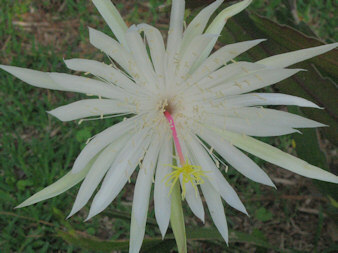 But now, I’m going to see if the other Cereus flowers are opening so that I can enjoy their wonderful fragrance. Memorial Day is a holiday that we use to commemorate US men and women who have died in military service to our country. On the north side of our property is the garden area where shades of pink, with a few purple accents, predominate. This is where I first planted azaleas that were a pinky-purple shade. To prevent color clashes when the azaleas were in bloom, I started planting other shrubs and perennials that would blend in with the azaleas, and before I knew it I had a pink garden. Here are a few that are blooming right now. 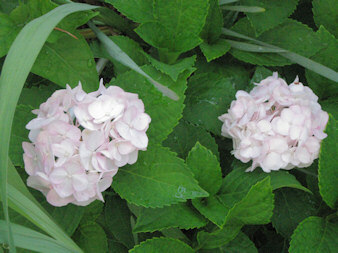 This hydrangea is really white, but the last two years it has opened as a very pale pink that fades to white. I have noticed this pink to white in other of my white-blooming plants, namely Iceberg rose and a white New Guinea impatiens. This is Blushing Knockout Rose. It has just started to put out another flush of blooms. The Japanese Beetles chomped on it a bit about two weeks ago, but it is bouncing back quickly. I have just started having problems with those beetles. I am thinking I need to do something about them, but if the neighbors do not, am I just wasting my time and money? 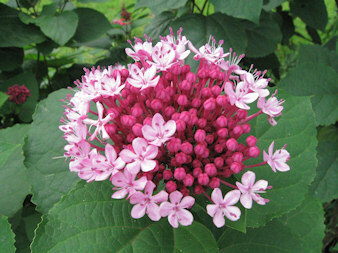 The Cashmere Bouquet (Clerodendrum bungei) is really starting to put on a show. The top photo shows the buds just starting to open. 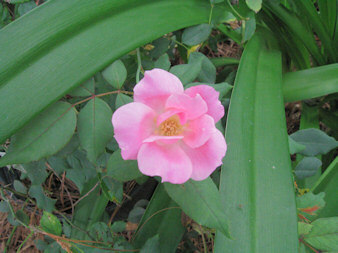 I love the dark rose color of the buds next to the lighter pink open flowers. The pink Vitex tree is starting to bloom, but not enough flowers are open to make a good photo. My big crinum is in that area too, and it also has bloom stalks that will be open any day now. So, whether it is pastel pink, pale pink, medium pink, hot pink, or cherry blossom pink, it has a place in this garden. It never ceases to amaze me how tenacious Mother Nature is. Every day we see plants growing in the most inhospitable places, and often they are flourishing. Cracks in concrete, brick walls, to name a few. Gardeners go to a great deal of trouble to make sure plants have the right ingredients to grow – drainage, soil amendments, fertilizers, etc. Propagation methods sometimes require multiple steps, and still success is limited. Seeds must be scarified, stratified, etc. How did some of these plants ever make it at all is a mystery. 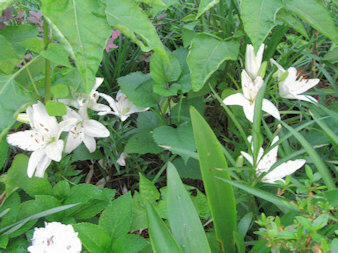 These little lilies are growing in my garden this year. I planted them in the late winter. I don’t know how these survived from last year. They were purchased last spring, were labeled as “Easter Lilies” and were in cute metal containers about 5 inches square and about 5 inches deep. There were three bulbs per container. Since there were no drainage holes, I punched two holes in each one and planted the bulbs. Sure enough, they soon sprouted and bloomed. They looked very nice on the front porch. After they bloomed, I just put the containers in the side garden to get some sun. I would water them, and they eventually went dormant. In the meantime, I had planted some lilium longiform bulbs, and they did fantastic. I pretty much forgot about the little metal container ones. During the winter after a severe rainstorm, I found that the drainage holes evidently got clogged, and the entire container had an inch of water sitting on top. I turned the containers on their sides for drainage, and that is how they remained for the rest of the winter. In the spring, I saw some green sprouts and couldn’t believe my eyes. I quickly planted them in the garden, and five of the six are up and blooming. Now, you know if I had really wanted those things to survive, they wouldn’t have. Lilies need care, good drainage, etc. Through benign neglect, these little bulbs survived and flourished. Go figure. It is amazing how the will to survive is so strong in everything. I can remember it so well. It seems like it was only yesterday. I am referring to my first real plant purchase many years ago that started me on my way to being a true gardener. When we bought our house, it had many large gardenia bushes and a few azaleas near the front of the house, and some yuccas around the patio, but that was about all. No garden beds, no annuals, no real color. Buying your first home and being six months pregnant was pretty overwhelming, so the yard was maintained by dear hubby who basically cut the grass. My daughter was born in late November, and that fall and winter turned out to be the coldest in twenty years. We even had an ice storm (unheard of in south Louisiana) Having a tiny baby and going back to work kept me pretty busy that spring and summer. But, when the fall came, Wal-mart had packages of daylilies. I thought it was time to start planting a garden and excitedly purchased two packs of dry, bare root daylilies called Plum Tree. These plants were tiny, but my hopes for a garden were large. So, in the ground they went. They soon went dormant. I didn’t know about dormant daylilies then, so I thought they had died. But, the next spring, they popped up and grew into small plants that didn’t bloom. Disappointment prevailed. The next year they did send out a few blooms, and the next year even more. These daylilies have become very prolific bloomers and do very well here in the heat and humidity. 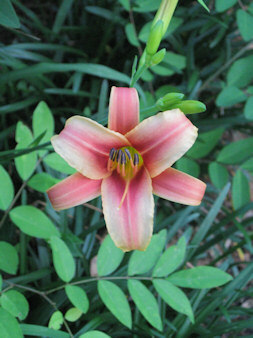 They have just started blooming, taking over when my yellow daylilies’ flowers are tapering off. 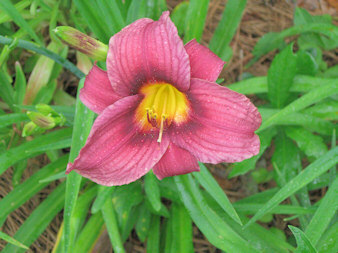 These are small daylilies, but they make up in flowers what they lack in size. 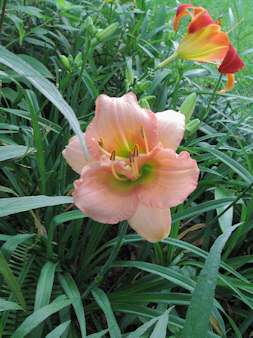 These are in full sun, but the color does not fade as some of the darker daylilies will. 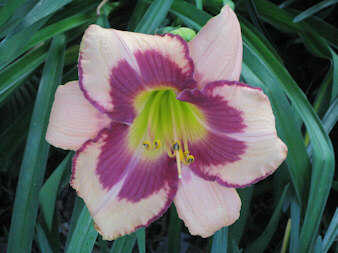 Having the original plants after twenty years show that daylilies can be very long-lived. It was many years before I went on to purchase more daylilies, but pretty, little Plum Tree, being the first, will always have a special place in my garden. The little Madonna Lily (Lilium candidum) has finally bloomed. It seemed as if the bud would never open. I bought this bulb about ten years ago. It was the first and only lily I had until last year. I thought just the idea of having a bulb that had such a long history was really neat. It has been in cultivation for a very long time. It is said that this lily has been in cultivation since the ancient Greeks – 1500 years before the birth of Christ. This lily is different than other lilies in that its leaves start showing in fall, as a small rosette, and is very hardy, freezing temps do not affect the foliage. It is not stem rooting so the bulb is planted just a few inches below the surface. 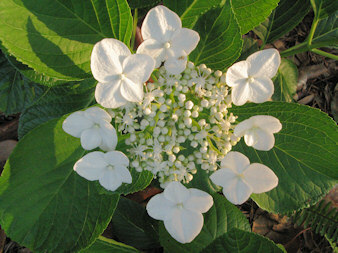 It has very white petals, a lovely fragrance, and has been a symbol of purity and innocence. 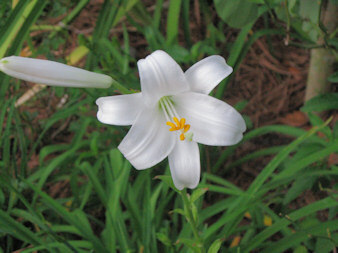 This is the lily that the Madonna is shown with in medieval paintings. 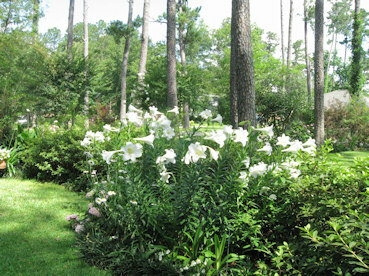 It does prefer alkaline soil, drier soil than most lilies, and does not like to be disturbed. Mine did not bloom last year, but this year has sent up more stalks than ever before. It seems to either flourish in a garden or just barely exist in others. Mine is somewhere in between, but I think it might need to be divided, so I will probably do that in the fall.